As any of you who know me will be aware, I am a young craftsman based in the West Country, scratching a living from carving spoons, cups, Box wood crochet hooks, and other treen. I am fascinated by traditional crafts and woodland management and am determined that I will make a living from these things. Because of this I have decided to do an apprenticeship in the area of coppicing and green woodworking. Coppicing is a form of sustainable forestry that has been practised for thousands of years. Deciduous trees are cut, low to the ground, and instead of the stump dying off, as would happen with most conifers, new shoots are sent out. If the woodland is managed well, these shoots will grow straight and true and will be cut again in later years when deemed sizeable enough for their intended usage. This form of management dramatically extends the life of individual trees, as they are kept in the juvenile stage of their life cycle and there are less stresses placed on the tree by weighty limbs. This form of woodland management means that timber and other wooden products can be harvested from a woodland almost indefinitely, with little need for replanting. It is also very beneficial for wildlife. The soil is not disturbed and so delicate species of flora and fauna can flourish, many of which favour the various stages of a coppice rotation over full canopy coverage. However, in recent decades this sort of management has declined, in favour of the short term return of conifer plantations and as other materials such as plastics replace wood in many aspects of life. 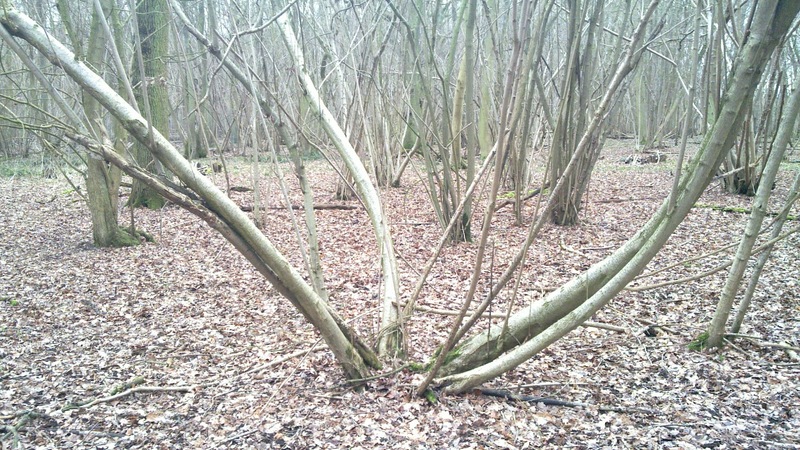 Sadly, when a coppice woodland is abandoned it becomes overstood – the stems may grow too large and twisted to be useful for anything other than firewood, and the stools (coppiced trees) will begin to tear themselves apart, letting in rot and disease. 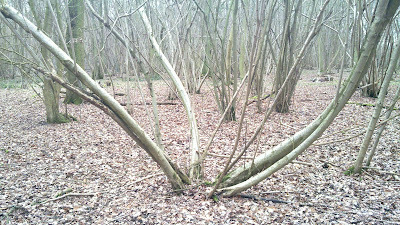 In a relatively short time the woodland becomes unproductive and lacks the biodiversity of an in-rotation coppice. It is then a substantial undertaking for anyone wishing to again harvest a useful product from the woodland. As people are beginning to realise the threat of climate change and the part that an over reliance on fossil fuels and imported products plays in that, coppicing is once again becoming important. Coppice products can reduce our reliance on foreign imports of timber as well as providing us with locally sourced building materials, fencing, firewood, furniture, food and much more. It is necessary to revive this ancient, but still relevant practise, in order to become more sustainable and self-reliant as an island. I have been making things out of wood for a good few years now, gradually honing my whittling skills, as well as getting out into the woods and trying as many different aspects of green woodworking as possible. Now I feel that the time has come for me to get my teeth into coppicing by training with an expert, so that I can practise the sustainable woodland management that I feel to be so important. Tim Gatfield at the Cherry Wood Project has agreed to take me on as an apprentice for a year, but to make this happen, I need to find the funding to support me in buying the tools, equipment and training necessary, as well as a small amount to cover my living costs for the year. During this year I would be restoring derelict coppice, by cutting overstood stools, replanting to increase the density, felling and milling conifers and deer fencing to protect the newly cut and planted trees. I would also learn many different aspects of green woodworking and related skills including making furniture, hurdles, bowl turning and earth oven building, as Tim runs many different courses in traditional skills. By donating towards my apprenticeship fund you are helping to keep traditional skills alive and encourage sustainable woodland management. You can donate to my fund by clicking on the donate button on the right hand side of my blog.